This blog post was written in collaboration with our partner Insert, a platform that provides in-app marketing at the speed of life. Implementing contextual experiences seems like a no brainer given the stats. However, most brands haven’t figured out how to create in-app experiences that speak to consumers and encourage conversion. While many have collected the user data over time, they are yet to act on the insights. To help you get started, we’ve pulled together examples of context-driven experiences that can help you drive conversion in your app. Oftentimes, marketers will want to address a change in the market that affects their brand; be it a newsworthy event, or a move by a competitor, the ability to quickly respond to changes in the market can translate to a big win. In telecommunications, for example, competitors often launch campaigns to lure customers away from each other, and explicitly address consumers’ pain points with their existing providers. As a marketer, if your customers are responding to such campaigns, your strongest weapon is to address it immediately. Users might log into their app while listening to a radio ad, and so timing is everything. 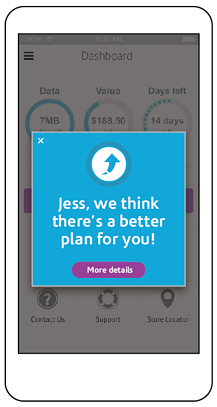 Anticipate their response, and set up an in-app message that is displayed to any customers who visit the plans section of your app. Addressing their anxiety is the way to retain them as customers and fight the competition. Knowing your users past purchasing behavior is powerful information that you can use to improve their app experience and keep them coming back for more. 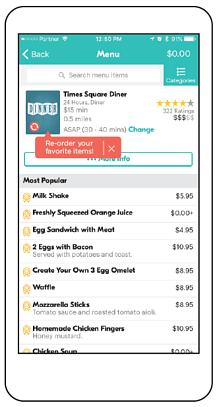 This food ordering app did just that by creating a feature that lets loyal users reorder their favorite meals to save time deciding and navigating the app. But building a feature isn’t enough, how do you make customers use it? Context. This app displayed a special tooltip to any users who enter the menu of a restaurant they’ve ordered from before. The tooltip highlights the feature, and the user feels known and understood by the technology. This promotes both usage of the new feature, and a more seamless experience for the user. Responding to how a customer is using the app in real time is arguably the most effective way to drive conversion. Showing a coupon that doesn’t apply to the user runs the risk of being annoying, and of never being used. But showing a coupon that is triggered by crossing a threshold in the shopping cart, when the user is ready to check out, is much more likely to result in a conversion. 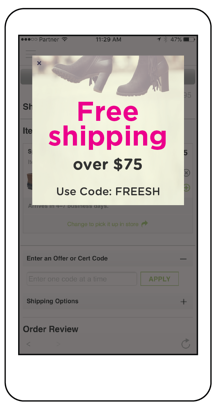 In this example, a shoe retailer did just that; users see the free shipping coupon when the amount in their cart is above the threshold, and the coupon is displayed directly above the field where the code is to be used. At that particular moment, the user needs it, and it can be the deciding factor in completing the purchase. Context is the difference between feeling spammed and feeling heard, which is also the difference between churn and loyal users. With the right strategy (and tools) in place, you can ride the rise of mobile app eCommerce and reap the benefits too. Are you prepared to seize the opportunities that come from your buyers’ increasing affinity for your mobile app? Will you be sitting on the sidelines, quietly watching your mobile revenue grow, merely observing the trend? We invite you to rise above the competition, and we can help you do that. Talk to us to learn how. Interested in reading the full report? Register here for Insert's upcoming PERSONALIZATION FIRST webinar, featuring senior Forrester Research analyst Jennifer Wise, and receive your own copy.